Interact naturally without wires in your way on the table and the floor. The Max Wireless Conferencing phone brings you ClearOne's industry-leading professional audio technology and advanced processing for crisp, clean sound in an easy-to-use conferencing phone. Simply plug in the base unit and start talking. With the modem Max Wireless Conferencing phone complementing your conference room, you're equipped to accomplish more in every meeting. Max Wireless Conferencing phone eliminates restrictions imposed by wires. Simply plug in the base unit and use the phone in any room within signal range. The wireless design creates a clean look, without all the wires and cords that can be tripped on or run over with chairs. Max Wireless Conferencing phone models use either the 2.4GHz WDCT (Worldwide Digital Communications Technology) or the 1.8GHz DECT (Digital Enhanced Cordless Telecommunications) standard, depending on the wireless requirements where the phone will be used. Both wireless standards are stable, extremely reliable and have a reputation for maintaining excellent sound quality. Max Wireless Conferencing phone features Gentner Distributed Echo Cancellation, noise cancellation, advanced audio processing and full-duplex performance, so you can count on clear, highly intelligible audio for effective, interactive conferences. 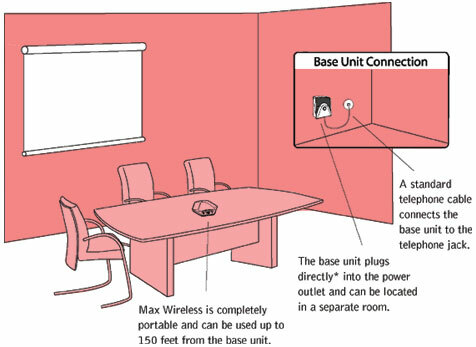 Max Wireless can turn any room into a conference room and provides a clean look with no wires on the table or floor. The clear, full sound of Max Wireless facilitates more natural interaction among participants. With the press of a button, access a conferencing services operator who can connect an unlimited number of participants. The intuitive, user-friendly controls are simple to operate. Perfectly suited for budget-minded customers who demand quality. The Max Wireless Conferencing phone is a great option for small meeting spaces, executive offices or clustered rooms that can now share a phone. 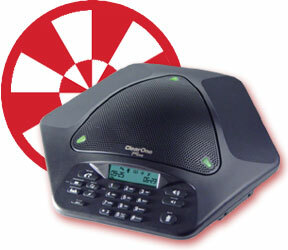 The Max Wireless Conferencing phone accommodates up to eight participants.